The Sacred Journey class will help you to understand more clearly and deeply your own language of interpreting energy and intuitive messages that you are already receiving. The class will give you the tools you need to work with energy in a healing capacity. You will learn how to provide Shamanic Journeying for yourself and those in need of healing. You will learn how to trust your inner guidance by connecting with the Divine, your guides, and power animals. We will rely heavily on many Shamanic perspectives for most of the class, but understand that by taking this class you will not become a Shaman. A true Shaman is born into her destiny and comes from a long lineage of Shaman, living a life steeped in a very strict tradition, ritual and ceremony. Shamanic Sacred Journeying can be learned by anyone who desires to learn it — it is within every person's ability to journey for themselves and for others. You will develop a more conscious relationship with that part of you that is a part of the Divine. Prerequisite of Reiki or Animal Communication series by Rebecca Moravec or other soul-based courses or practices. In the Sacred Journey coursework you will reinforce your daily meditation practice; read and discuss 3 or 4 books from related areas; learn the practice of the 5 Tibetan Rites of Rejuvenation for focus and physical well being; learn several techniques for clearing the energy field. It is my pleasure to introduce these principles over the course of one year of study, one day a month, the schedule to be mutually agreed upon by the participants. Next session begins early fall 2014. Please call Linda at 847-721-5061 or email leafygreenlinda@me.com for more information. (with your veterinarian's permission) in person or telephone. or shattered energy. Energetic restoration is a powerful tool that helps us to heal emotionally, physically and spiritually. A feeling of wellbeing, wholeness and a greater connection to the Universe is experienced after Shamanic energy work. If you would like more information or would like to schedule an appointment, please call 847-721-5061 or email leafygreenlinda@me.com for more information. Linda is a Level II Practitioner in the Tibetan Black Hat Sect of Feng Shui (pronounced like “fung schway”). a natural and empowering alignment of positive chi in the built and natural environment. The application of positive Fung Shui allows individuals, families and their animals, and co-workers to more effectively function in life, either at home, school or at work. 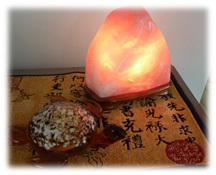 Like Reiki and other personal energy work, properly applied Feng Shui taps into the well of universal energy. energy in any living, learning or working environment. 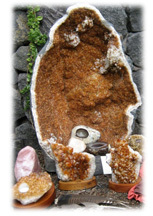 Techniques for balancing a space include the use of color; placement of geologically formed crystals such as citrine, amethyst and rose quartz; and traditional cures such as redirecting the flow of energy in a room through furniture, fountain, and plant placement. Private Reiki healing energy sessions are offered at Linda’s home in North Barrington, Illinois. Group instruction for Reiki Levels I, II, and III (Master Level) can be scheduled at your location or in Linda’s home.